Hello, friends. Do you want all the information about the Asian University of Bangladesh? So, why are you waiting for just read this article? Here, we are going to give you all the information about AUB. And, we are also going to tell you the tuition fee structure of AUB. So, read the below. The Asian University of Bangladesh is one of the famous private universities in Bangladesh. 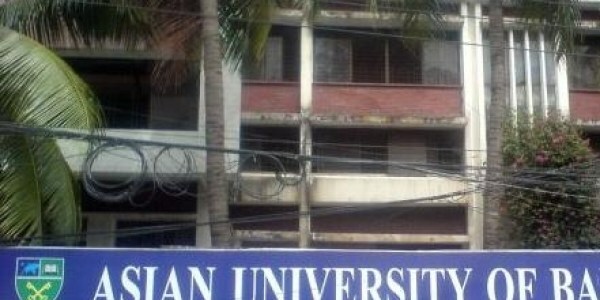 This university provides a sound education in Bangladesh. It is established on 4th January 1996 under the private university act 1992. Dr. Abul Hasan Muhammad Sadeq is the vice chancellor of this university. And, this university refers as AUB. It has four campuses in this country. And, those can locate in Dhanmondi, Rajshahi, Uttara, and Khulna. The University Grants Commission has affiliated AUB. Also, this university is managed by the university trust. Now, do you know how many students study in the Asian University of Bangladesh? The answer is total 7500 students study in this university. AUB has a great campus facility for students. It has a big lab with different equipment. It also has 5 computer labs with the internet facility and 125 PC. And, it has a digital lab for students. The hostel facility for students is good in AUB. They provide 3 different hostels for female students. And, students get 75% sacrifice on their tuition fee for A+ on HSC exam. The Asian University of Bangladesh has total 12 departments with 5 faculties. And under those departments, it provides unique education. And, those departments are given below. Department of Govt & Politics. Department of Sociology & Anthropology. Department of Islamic History & Civilization. Department of Information Science & Library Management. Now, you must be thinking how much it will cost you for the entire course? Actually, Asian University of Bangladesh’s cost is little cheap compared to other private universities. And, now we are going to tell you the tuition fee of all the departments of AUB. First, let’s see the bachelor’s program fee. B.Ed. and BBA course’s total cost is 9,900 and 1, 91,500. And, Bangla and English course will cost you 38,300 and 1, 20,900. Now, the Computer Science and CSE will cost 2, 51,100 and 2, 70,500. And, the other courses will cost you Government & Politics 38,300, Islamic Hist. & Civilization 38,300, and Islamic Studies 38,300. So, these are the cost structure of AUB. Here, we are going to give the contact info of the Asian University of Bangladesh so that you can contact there for any information you need. Address: House 25, Road 5, Sector 7 Uttara Model Town, Dhaka-1230. Telephone: +880-2-8912366, +880-2-8916116, +880-2-8950732, +880-2-8922992. Finally, we hope you found much info about AUB. And, visit our website to get updates about the Asian University of Bangladesh.